During the wash down of fuel tankers, vehicles, and various other equipment, many customers are looking for a quick and easy berm or berm liner to temporarily place underneath these vehicles. For this type of containment, items known as a Spill Containment Berm can be the perfect solution. 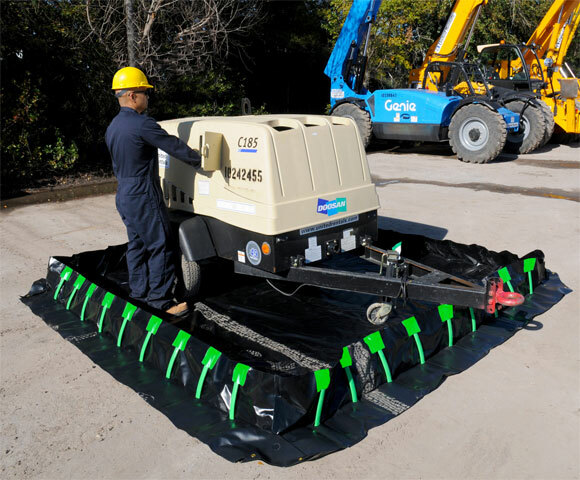 Made from a flexible fabric material, these berms are able to be placed quickly on the ground for use under machinery, cars, spill equipment and various other moving items. Both of these option will include foam wall ends that allow for customers to drive directly over the ends of the berm. This allows customers to easily get their equipment into a containment area. With quick setup, easy transportation, and drive over walls, these berms have been frequently used in mobile car wash services and other vehicle washing to contain potentially harmful materials. Read more about Secondary Containment Products.